Binary Scam Alerts is issuing a severe SCAM warning on the Option Sniper Software (AKA Options Sniper APP). After conducting an in-depth review and investigation of this fraudulent software, our team of researchers has reached some extremely troubling and disturbing conclusions you should be made aware of before investing. Below you will see Option Sniper’s balance sheet indicating high payouts based on presumably high ITM ratios and success rate in trades. In the second image below you will see the same sheet from a website called coopersdivertimento.com, which is in my opinion a satellite site directing unsuspecting day traders to similar binary options scams. If you take a closer look at the names you will see its the same ones and the chart has been slightly altered to hide the lie. This site is actually so nasty that it’s also selling fake diabetes pills offering to lower high blood sugar levels, and selling fake medicine which is probably the most vile and disgusting online crimes I can think for obvious reasons. 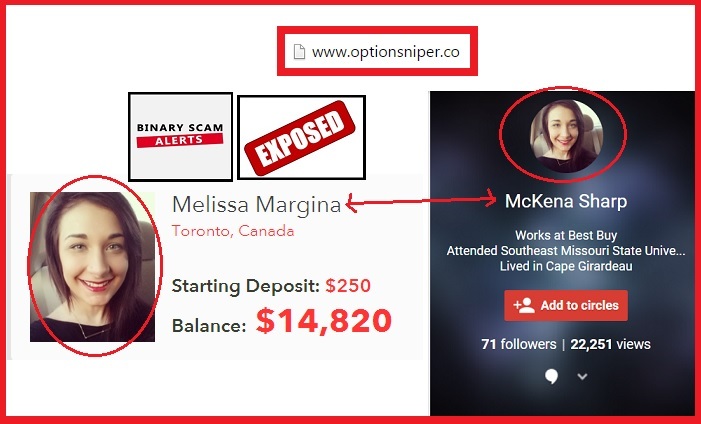 The famous Mellissa Margina is really McKenna Sharp, and she is probably not even aware here picture is being used and abused in a nasty binary options investment scam. These crooks simply ripped off her picture because they thought she fits the profile and changed her name for marketing reasons. Day Traders Want to Know! The reason I decided to do this review and not some of the more heavily advertised scams like binary secret or your legacy is because we had an inquiry from one of our members, and as a service we decided to actually go ahead and conduct a complete scam review. This software is definitely not what it claims to be, and you can forget about Autopilot earnings of $800 a day. It is a fraudulent app and there is nothing honest, genuine, or legit about it. If you believe robust trading tools such as signals, candlestick market analysis, various and various trading strategies will help you achieve a high ITM ratio, you are deeply mistaken. The creators of this fake app will intentionally take losing positions and deplete your balance in a very quick and effective manner. If you have a trained eye or alternatively have been previously scammed by fake systems, you will immediately see that they all have similar characteristics. Some of the more well-known and notorious ones are Insured Profits, The Free Money System by Walter Green, Copy Buffett the disgraceful app, Zulander Hack, Citidell LTD, Centument, Tauribot, Binary Matrix Pro, Binary App 810, and Push Money App. If you are starting to doubt yourself and actually ask yourself the difficult questions like: “Is it really possible to profit from binary options”? Then you are making good progress since eventually you will end up using a reputable signals tool like the binary profit method or Virtnext. Option Sniper is another in a long line of fake trading systems trying to sell you the world on a platter. If you have been presented with inflated bank accounts and actors trying to push a dream of endless wealth and prosperity, it means you are being set up to take a fall because if its too good to be true it’s usually a scam. If you believe you have come across something genuine or legit, you are severely mistaken and you will end up losing your money. If you have already bought into this scam and lost your funds, please contact us at [email protected] and we shall try to recover your stolen funds for you.